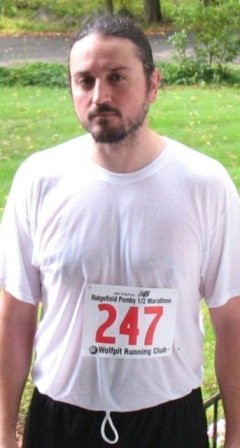 Ran the ½ marathon today and as expected my performance was dismal. I ran the course in 2:14:58, at the pace of 10:18/mile. Last year I finished the race in 2:02:32 and the year prior to that my time was 1:55:52, and the one before that at 1:54:05. Beginning to see a pattern here. But this was my first race with a herniated disc, so I guess I can cut myself some slack here. The race started at 8:30 AM in a cold rain. I absolutely hate running the rain, but not much can be done about that. Some people had bundled up to face the cold and wetness, others (myself included) were going to brave it with only a t-shirt. My rationale was that extra layers will get heavy in the rain and besides the running will warm me up anyways. I hadn't taken any painkillers this morning so I was expecting back discomfort. The discomfort was there, some radiating pain and tingling down my left leg, but eventually it subsided enough that I was barely aware of it. I had decided early on to pace myself in this race, as in, go slow and steady to avoid any potential aggravation of my back. I pretty much stuck to that the whole way through. While I knew this would hurt my finish time, I had no idea about the positive side effect. In the few years that I have run in this ½ marathon, this race was by far the most pleasant and enjoyable of them all. Ironic, considering my fears of back pain flare-ups. The rain was a nuisance, but unlike past races, I finished the course barely tired and in no pain. In fact I could probably continue for another 5 or 6 miles with ease. I never downshifted to a walk, nor did I stop at any water stations. It was as if I wasn't even in a race. I was paying more attention to my surroundings (beautiful, scenic nature) than to the race itself. I feel a bit conflicted over my time in this race. I guess I should be disappointed, but I'm really not, and here's why. As recently as a week ago I didn't even think I could handle the course and here I was crossing the finish line. To top that off, it went smooth and steady and it turned out to be the most enjoyable ½ marathon ever. For the first time ever, I actually began entertaining thoughts about running a full marathon.